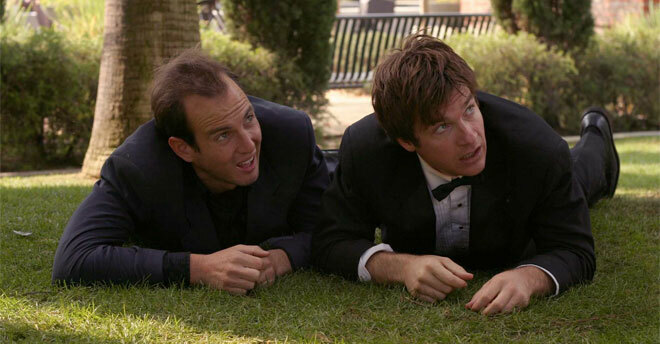 I may have wasted entirely too much of my morning watching the hilarious videos on DumbDumb, the marketing brain child of actors Will Arnett and Jason Bateman. The duo first appeared together in the wildly popular television series, Arrested Development, just before taking off on their own individual careers. Now with a collection of comedic movies in their portfolio, they’ve put together DumbDumb in what Bateman calls a very “freeing” way to pursue what they both love: comedy and acting. DumbDumb (which the duo jokes is named after Arnett) is a “comedy enterprise” that utilizes both Bateman’s and Arnett’s very familiar comedic tone and writing to script marketing and advertising ads for companies such as Denny’s, Orbitz, and now Blackberry. With special appearances from guests like Sarah Silverman, etc, the two are effectively generating their own revenue with laugh-out-loud funny marketing campaigns for affiliated partners. Check out one of our favorite skits for Orbitz below.